Mechanical keyboards are defined by their switches. In the Filco Majestouch-2 and many others, it is Cherry MX switches that are used. In this article, we’ll look at the many different kinds of Cherry switches on the market and see how they compare to one another. Cherry Corporation was founded in the United States in 1953 and started producing keyboards in 1967, making them the oldest keyboard manufacturer in the world that’s still in business. The company was moved to Germany in 1967 and bought by ZF Friedrichshafen AG in 2008, but keyboards and mechanical switches are still produced under the Cherry brand. Their most popular line of switches, the Cherry MX series, was introduced around 1985. These switches are usually referenced by their physical colour, with each colour denoting the switch’s handling characteristics – whether it is clicky, whether it is tactile, and how much force is required to actuate the switch, in centi-Newtons (cN) or grams (g). Now that we’ve explained a bit of the background information, we can have a look at the switches themselves – starting with the four most common varieties. Linear switches have the simplest operation, moving straight up and down without any additional tactile feedback or loud clicking noise – we’ll come to these more complicated switches later on. There are two common types of linear switches – Black and Red. Tactile switches provide, as the name suggests, additional tactile feedback as the key actuates. As you press the key down, there is a noticeable bump which lets you know that your key press has been registered. Clicky switches add a deliberately louder ‘click’ sound to the existing tactile bump, allowing for greater typing feedback. This makes it easier to know that you’ve hit the activation point. This is achieved by a more complicated mechanism, with a blue plunger and a white slider. When the actuation point is reached, the slider is propelled to the bottom of the switch and the click noise is produced. Clear switches are a stiffer version of Brown switches, with a tactile bump and weighting of 65 cN. Grey switches are used for space bars on Clear keyboards, with a weighting of 80 cN. Green switches are a stiffer version of Blue switches, with a tactile bump and audible click, weighted at 80 cN. It is primarily used for space bars. White switches are very similar to green switches, with modern versions being weighted the same (80 cN) but being slightly quieter. Super Black switches are extra stiff (150 cN) linear switches designed for space bars on keyboards with Black switches. Dark Grey switches are moderately more stiff linear (80 cN) switches designed for use as space bars on keyboards with Cherry MX Black switches. Cherry MX Lock switches are locking linear switches that stay down until pressed again, typically used for Caps Lock and TTY lock in keyboards before the 1980s. So there we have it – information on the various MX switches produced by Cherry and now ZF Electronics. I hope this has been useful – if you have any questions, feel free to share them in the comments below! You can also ask on Twitter or Facebook. Finally, if you’d like to pick up a few switches to play around with, then you can do so on our switches page. Thanks for reading and have a good one! Animated Cherry MX images from Lethal Squirrel on Geekhack.org. Great. Very comprehensive and useful info. I liked the part that which switch is useful for typing. Just bought myself a mech keyboard, with brown switches. The blue maybe a little too noisy to type in office. You can get a pack of rubber O-ring dampeners for less than $10. Search for “Cherry MX Dampeners”. Several of the guys at work have MX Blues. One dude has the O-rings and it makes a huge difference. Heh, you think blues are loud? Try ALPS/Matias switches, you get typing good at 60/wpm, you begin to annoy the neighbors, they really are the loudest switch out there, but man, do they have tactility. Cherry MX switches that are used. In this article, we’ll look at the many different kinds of Cherry switches on the market and see how they compare to one another. There are two common types of linear switches – Black and Red. Thanks for the Cherry MX mechanical switches KB explanation. I needed that. I have a CMStorm hand-me-down mechanical keyboard. It’s a low-end KB with a mew price point around apprx. $120 thru Amazon. I believe it is a Brown switch version because its keys have a middle of the road response which I enjoy for writing. It is also somewhat stiff which keeps my fingers focused upon the accurate keys. This KB makes some noise as I type very fast when I am writing, and it is a tad sluggish for simple gaming uses. However, a board that would have a stiffer touch would cause more arm-wrist fatigue for me, and a KB that would be for gaming use would also cause me fatigue because it would allow too fast movement leading to too many typos and the extra energy to correct them. I have used an inexpensive, regular PC KB, a Dell, with rounded keys that is one of the fastest and most accurate KBs I’ve used. However, I have no idea where in my school library it’s located or any model information to include in this post. All that said, I’m going to stick with keeping as much of my money in my pocket as possible despite opportunities to buy new hardware. Sometimes, new and improved is neither (“new” or “improved”). BTW: I really enjoy the blue backlighting on this KB. Go with browns. Reds are ultra sensitive, very easy to hit the wrong key by accident. This article would have me believe that the actuation force on reds and browns is the same. Care to elaborate on what makes mis-actuations more common with reds for you? The primary difference between reds and browns is not so much the actuation force, but the tactile bump. Reds provide no tactile feedback until the key bottoms out, which is about 1.5 millimeters below the actuation point. Browns have a tactile bump at the actuation point so that with practice and some muscle memory you gain the ability to type quickly without bottoming out the keys — you can feel for the bump and constrain your keystrokes to the 2mm needed for actuation, not the 4mm of total travel. This results in less typing fatigue (less distance traveled, and reduced bottoming-out impact). But linear (reds) may be more desirable for gaming, as the tendency in gaming is to pound a little more, so bottoming out is not to be avoided. That being the case, the tactile bump isn’t necessary, and can even slow down the common gaming technique of key bouncing. I prefer red’s for typing and gaming. As a touch typist I find that the tactile bump on Brown’s just gets in the way. I think you’ll like the tactical feedback of the brown switches better than the red. The brown switches make a bump that you can feel, but don’t click. If yo are a touch typist and like the feel of a typewriter, but don’t want the noice then brown is the right choice. I love blue because I like the tactical feedback and the clickity clack. I personally love the Blues for gaming. And I really love them for typing in the office too. The people around me don’t love it so much due to the noise, but I can type so much faster than with any other switches. It has the same feel as my very first computer keyboard in ’87. I loved that keyboard and I love my new one now. Hello Brook! thanks for your comment, could you please say me what your first computer keyboard was? I loved the 486 HP keyboards when I was in school in the 90’s!! The blues remind me of the old IBM PC/XT keyboards. Hi, just reading through this site and I saw your post. I was almost convinced to get a Blues keyboard because I type for a living and I have heard the Blues are the best for that. I type at home so I’m not worrying about the noise bothering anyone. Have you tried other colors (like the browns), and do you feel the blues are the best for typists (for speed, accuracy, etc?) You said it feels like the old keyboards from the 80’s, I remember those well. Are they also like the IBM Selectric typewriter keys? Those required a little bit of a push though as I remember. thanks so much in advance. Blue switches don’t require as much effort to push down as a typewriter key, but they’re towards the upper end of the scale when it comes to mechanical keyboards. Blues being a “typists’ switch” is largely a matter of reputation; I personally write with brown switches primarily and know people that write with every other kind of switch. It’s a matter of preference, and it’s well worth trying a few switches to see what you prefer. The blues are easier to push down than you may think, personally I feel that blues are as easy to push down as the browns. Cherry MX Greens are the stiffer version of the Blues, they will be a much closer feel to the typewrite feel you’re looking for. The browns and the reds aren’t that much different in terms of required force for actuation. The reds are very quiet and smooth, but are way too mushy for my preference. The browns are just as easy to press, but they have a slight bump when actuated. If you’re still having trouble deciding, get a sampler off of amazon. It’s a little pricey (20 bucks for the 8 switch sample) but totally worth it. I was convinced that I wanted the browns, but after trying all of them I actually preferred the greens (Tactile and clicky) and the clears, which are just the stiffer versions of the browns (tactile and silent, you feel a bump when actuated). Unfortunately those switches are hard to come by and are not included in most of the popular gaming keyboards. I was gunning for a Corsair Strafe RGB, but after trying all of the switches I was disappointed to see that they typically come in the 3 common switch types; red, blue, and the browns. I have been noticing more and more that they are offering a new “rapid switch”, but that doesn’t interest me, and assuming our tastes are similar it wouldn’t catch your eye either. Anyway, I hope this helps; albeit it is two months late so probably not. does anyone know what the difference with a green mx switch is? The MX Green is the heaviest clicky switch you can get — you usually find them as the spacebars in keyboards that use MX Blue switches elsewhere. It has a very firm feeling, almost like using a typewriter or old IBM Model M-style buckling spring keyboard. They’re very clicky and very tactile, so an interesting switch for sure. Very informative and I love the animations! The feel and sound of the keys are really important to me considering how much time I spend on a keyboard both at work and at home. on a youtube video with samples of the sounds of the different keys. No one stole anything, you chose to share it. The animations are very basic and a 3d version would be nice to see. Maybe it’s time to remake them and add the new switches like the Romers and others to the list. 3DS Max would be a good way to produce the animations. The Xerox iGen digital presses I am a Technician for use a lot of cherry switches for things like the door interlocks and I can’t believe how cheap they are and how fast they wear out and how easily they break, I’d avoid having a KB with them if possible. The only advantage to Cherry is the extremely low price, they are dirt cheap which is why a lot of KB makers choose them, but there are some companies that choose better alternatives to cheaper ones, but will cost the consumer a little more to buy, but will outlast the cheaper ones by far. Nope, they are very cheap switches, sorry you didn’t know that. They are the cheapest switches we have access to at work, so we go through a lot of them as they break constantly. Has anybody tried the full hand keyboard? If so, do you prefer it to the standard one? Sorry, what do you mean by full hand keyboard? The casing is extended at the bottom so that you can rest your wrists on it. I’m just wondering how big it is and if it’s practical or just a selling feature. I think I’m in the wrong place. I’m not sure how I ended up here. I was looking for a thread for Ergodox. Haha, don’t worry about it. Regretfully I haven’t tried the Ergodox so I can’t really help. Maybe try asking on mechanicalkeyboards.reddit.com? I was researching the different switches I guess because you can pick which ones you want and I forgot what forum I was in. I’m pleading heatstroke and age LOL!!! Thanks a lot! This was helpful! GREAT! Great summary! And I agree with the others, the animations are very helpful too. The reds are just a slight bit too easy to press down to me, to where if I rest my hand on the keys i might accidentally press one down! A green switch is essentially a heavy blue switch, designed to be used for spacebars. HAH! Now I can prove my friend wrong about how heavy blue switches are. Haha – those were announced a fair while after this article was written! In addition, Cherry MX RGB switches are still red, blue or brown – they don’t affect the function of the switch, only its look. Great article! I have always been intrigued by mechanical switches and wish there was somewhere I could go to compare all four. I’m a heavy-handed “angry” typist so the black switches appeal to me the most although as a FPS gamer that probably wouldn’t be a wise choice =). Best explanation ever, thanks! I guess I’ll be sticking with the MX Brown as I had originally thought. Just get a Model M keyboard. Cherry MX switches are a joke compared to buckling spring. I’m curious to try the Clear switches. I’m using the Brown ones. But, at times, they feel too light. I like the greens, whites, and blues the best. I have a SteelSeries 6G V2 with Cherry MX Black switches. satisfyingly weighty feel without feeling too heavy. noise and bump but I do wonder if the blues would be better suited to typing. I have that same keyboard. When playing FPSs, since you have to keep pressing W to advance for a long time, I get kinda tired… do you feel something like that? No, but I’m pretty heavy handed and appreciate the extra resistance of the Cherry Black switches. SteelSeries make a Cherry Red switch version now that’s much easier on the fingers. Ok, thanks for answering, I did not know about the Cherry Red version. I am overall satisfied with the 6gv2, it is just the W key that bothers me a bit because it is by far the most used key. It was my first mechanical keyboard. I think it feels great for typing, I get that exact “weighty feel” you talked about in your first remark. Thanks so much for this very informative article, William. Based on this advice, I decided on a Das Keyboard Pro with Cherry Brown switches, as a quieter replacement for my increasingly flaky IBM Model M. The new KB arrived today, & it’s pretty much exactly what I wanted. It’s worth noting that while it’s quieter than a Model M, it’s still quite loud in comparison to your typical cheap keyboard, but I’m okay with that. If you’re a long time Model M user, I highly recommend the Cherry Brown switches. They’re not identical to the Model M’s, but I think they’re as close as there is on the market. agreed, or you can get a unicomp. The purpose of making a stiffer switch isn’t just to make it harder to press. It’s to make it easier to choose how FAR to press it. Like most KB switches, Cherrys actuate 50% through their travel. This means that any motion beyond that point is wasted time and energy. Lighter switches move so easily, it’s hard to control their travel, so you almost always bottom out. Stiffer switches like Blacks offer more resistance, making it easier not to bottom them out every time. If you use them correctly, with that in mind, they let you develop a quicker and LESS tiring typing technique by consistently pressing them only partway down. It’s hard for KB companies to describe all this, so they don’t try. Instead they let people think lighter = better, and sell lots of light KBs and and let people pound away on them. Only those who take a bit of time and trouble to educate themselves will benefit from stiffer switches’ superior design. > Lighter switches move so easily, it’s hard to control their travel, so you almost always bottom out. Hard is relative here. I have no problem typing on my MX Brown switches without bottoming out. I only accidentally bottom out every once in a while if I’m in a hurry. Though, I can imagine that it would be harder to develop a light and good writing technique coming from a keyboard with stiffer switches. Like going from Black or Clear to Brown switches. I like a very light switch and then set the ‘bottom’ to be at the actuation point so I can use it very fast, a lot faster than a heavier switch trying to locate the AP manually. I always mod everything I buy so it makes sense to do the same to a KB. I prefer custom built to off the shelf in everything from cars to clothes to computers and perhephrials. Great post. Thank you. Made my search for a mechanical keyboard a lot easier. Great, glad you find it helpful! My favourite is brown, but the clicky feel of Blue switches can also be very satisfying. Which keyboard requires the least amount of pressure? I type more than 500,000 words a year for work and desperately need a soft touch keyboard. Thank you. Try a keyboard with Topre or Cherry Red switches. If you email us (sales@keyboardco.com) with your requirements, we’ll try to suggest the perfect keyboard for you! I second Topre. I find them to be a lot less vulnerable to damage from dust and other foreign objects. The only bad thing is that they’re difficult to find in physical stores. I like to touch and play with keyboards before I purchase them. I’d go with Romer G switches. Light and the fastest switch. Greens are the closest to a buckling spring I’ve found. Coolermaster made a Trigger KB that used greens, I am not sure what models they currently feature that have them though. Hi Mads! 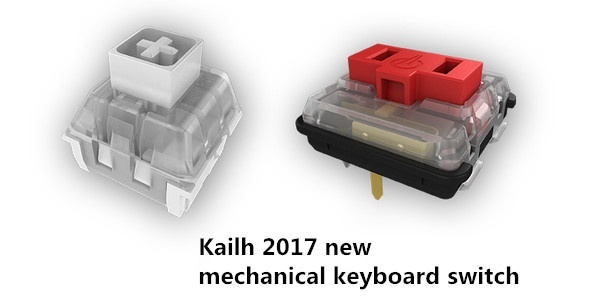 You can get switches individually if you want to build a keyboard from scratch, or you can buy keyboards that already include these switches inside. we are a group of students from a technical college in Denmark. We are about to develop a new keyboard. do you know, which software to use? Razer has recently released a line of gamer switches that are improved clones of the cherry mx switches but activate and reset faster, so that might be the choice if you are interested in better gear for gaming and e-sports. I don’t think the changes that Razer have made are substantial enough to make any difference in their suitability for eSports; most pro players just use what their sponsors provide and do fine. Nice thought, but it’s wrong. 🙂 What testing have you done? Just an off the cuff knee jerk reaction? Thought so. I have the Compaq PS/2 Slim Keyboard Model 5137, does anyone know what type of switch this keyboard uses? I would assume it has rubber dome (e.g non mechanical) switches. If you’re feeling brave, then pull off one of the keycaps and take a picture of what you see underneath. Wow! What a comprehensive review. It should be on Wikipedia!!! Thanks for the kind words — much appreciated. This is great, really helped my decision. I decided to go with a Corsair K70 with brown switches. I think the balance will be nice for someone who is in IT along with both gaming and typing for papers, documents, etc. Heck yeah. This article is easily the best source of Cherry switch info I’ve found. A very good read but it needs updating with such switches as the mx speed available. Hey, we don’t mess around when it comes to keyboards. Thanks for reminding us of the missing switches, and enjoy your weekend! I recently started looking at some high end keyboards and noticed something strange, specifically referencing Corsair K70RGB and Razer Chroma V2: All the keys with 2 symbols, such as numbers and the “<" etc. have the lowercase symbol etched at the TOP of the key-face, while the uppercase symbol is etched at the bottom of the key-face. This is just the reverse of all standard keyboards. I know that makes it possible for the lowercase to be lit up, but why do the key makers (Cherry, Razer) not insert the LEDs in the keys such that these keys have standard layouts? Touch typists will be OK, but I think those of us who are not well trained in keyboarding would have trouble pressing the shift key when we shouldn't. Any enlightenment on this design would be welcome. I'm holding off my purchase until I get some understanding. It’s to correspond to where the LED is on the switch, that’s all. You can always buy a keyboard and replace the keycaps later if you want. But then why do manufacturers not MOVE the LED and put the “proper” keycaps on in the 1st place. Or offer a keyboard with the “proper” keycaps. Seems a shame to spend all that money on a great keyboard then have to spend a few hours swapping keycaps you have to go buy separately. Or do most users not really care? Moving the LED requires significant engineering; only recently have we seen multiple options for its placement. In addition, most users don’t really care. Once you learn the position of the keys, it’s a non-issue; people can happily use keyboards without any printed legends at all. But if you don’t like this style of keycaps, simply choose a different keyboard or swap the caps. It seems CoolerMaster has solved this for their MasterKeys Pro series keyboards using standard Cherry MX switches. Maybe the symbols are not as bright, but at least they are in the visually “proper”places. If anyone is looking for info on switches not covered in this guide, deskthority is a much better resource. The less common switches are often some of the most-loved, but they might just not come in many pre-made keyboards. Cooler Master helped to increase the production and availability of Greens, luckily, but they’re still not in many boards from other popular brands, the ones marketed at ‘gamers’ especially. This helped me to pick which kind of switch I want, and the difference between them. Great article, and this helped me pick the switch I want and how they work. if I understand the way these switches work correctly, they’re rated for so many grams of force to activate? So if I wanted to so a metal and glass typewriter style keycap I would need to figure out how much each keycap would weigh to choose a good switch to use with it so the weight of the keycap doesn’t activate the switch on its own? Yes, that’s more or less correct. 98 Pings/Trackbacks for "An introduction to Cherry MX mechanical switches"